In America, so-called epidemics often give rise to new and interesting artforms. The crack era produced not only gangsta rap, but “hood” films as well. The earliest “hood” films were among the most notable and successful. Memorable though they were, they often exuded a certain level of xenophobia. They seemed to assume that poverty, racism, and street crime were uniquely American phenomena. However, a trip to any number of foreign countries quickly proves such notions wrong. On this very weekend ten years ago, a powerful film revealed just such a place when it premiered at that year’s Cannes Film Festival. It showed life in a Brazilian favela, and told a generational tale of the criminal factions that warred in its streets. Its title was Cidade de Deus, but it’s now better known to American viewers by that title’s literal English translation: City of God. City of God begins in the 1960’s, as a band of teenaged armed robbers known as “The Tender Trio” relieve a delivery man of his precious cargo. The trio consists of Shaggy (Jonathan Haagensen), Clipper (Jefechander Suplino), and Goose (Renato de Souza). Rocket (Alexandre Rodrigues), the younger brother of Goose (As well as the film’s narrator), regards the trio with respect and admiration. Such feelings are prevelent throughout Cidade De Deus, where the trio are seen as modern day Robin Hoods. The sullen Zé Pequeno aka “Li’l Dice” (Douglas Silva) hangs out with the trio, but secretly resents them. They treat him more like young wannabe than an affiliate. One night, after a hotel robbery turns into a blood bath, the trio is forced to part ways. Clipper finds God, but the other two members are tragically killed. Shortly after the fall of the Tender Trio, Li’l Dice and his young partner Benny embark on a murder spree that lasts well into the 1970’s. At the end of their bloody rampage, they emerge as kings of the city’s drug trade. As an adult, L’il Dice comes to be known as "Li'l Zé" (Leandro Firmino da Hora), and is feared by all. The comparatively laid back Benny (Phellipe Haagensen) tempers Zé’s bloodlust when necessary, compelling him to spare a local dealer named Carrot (Matheus Nachtergaele), whose operation is the only one left standing. Rocket (Luis Otávio) has taken to living a hippie lifestyle with his friends. Benny soon grows weary of the gangster lifestyle and plans to move on to greener pastures with his girlfriend. When he is murdered at a party, a distraught Zé goes on yet another murderous rampage, during which he rapes the girlfriend of local pacifist and ladies’ man Mané "Chicken Manny" Galinha (Seu Jorge) aka “Knockout Ned.” He then guns down Ned’s family members. This draws Ned into the ongoing war between Zé and Carrot. Ned becomes a gang leader and folk hero as the conflict grows bloodier. Rocket, who is now a photographer for a local newspaper, becomes the unofficial documentarian of a war that still looms large in the history of Cidade de Deus. 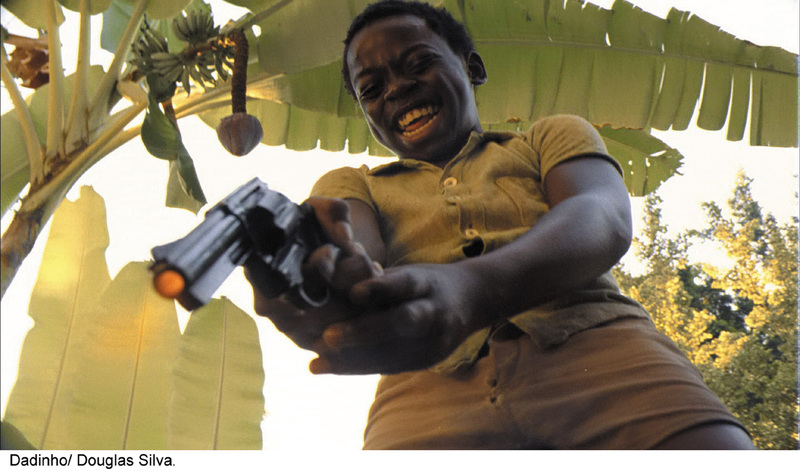 Cidade De Deus was adapted from Paulo Lins’s semi-autobiographical novel of the same name. The film is not a work of fiction, but a functional timeline of organized crime in a suburb of Rio de Janeiro. Its setting is exotic and its characters are vivid, yet such considerable assets were not all it has to offer. Director Fernando Meirelles and screenwriter Bráulio Mantovani fashion an interesting narrative from a number of interrelated storylines, all of which focus on a group of young boys growing up in an unforgiving world. 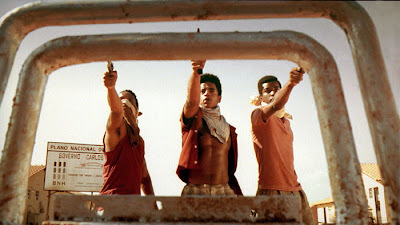 Cidade de Deus sets its sights considerably higher than its American counterparts, and as a result is not easily categorized. Though I label it a “hood film” for the purposes of this article, I do so mostly for lack of a better comparison. It’s not as obvious or as preachy as American urban dramas tend to be. It isn’t strictly a crime film either. Neither is it just a coming of age tale or a colorful history lesson. Its violence is shocking and sometimes revolting, yet undeniably thrilling at certain points. It never once romanticizes its subject matter. Cidade de Deus wears a number of different hats throughout the duration of its running time, and somehow manages to fulfill the responsibilities of each and every task it assigns itself. That’s a trick that neither Menace II Society nor Boyz n the Hood managed to pull off. Cidade de Deus has a visual style that actually evolves as the movie progresses. It begins in bright, dusty sepia tones that resemble the washed out hues of an old photo album. There’s an aura of warmth and nostalgia during the first act. By the end, the alleyways and streets of the favela are dark and uninviting, taking on much darker tones and murkier lighting. The carefree days of the Tender Trio’s playful banditry are long gone. The Drug trade has turned the city into a war zone. The transitional point is a murderous montage that shows "Li'l Zé" finishing off his rivals throughout the years. His face is obscured, but the passage of time is revealed by changes in his physical stature. This troubled little boy morphs into a full blown sociopath and gang leader. It’s one of the most effective visual moments in the entire film. Speaking of Li'l Zé, he is surely a character for the ages. He’s one of the single most hateful souls to ever to grace the screen, the living embodiment of the saying “misery loves company.” Even children are not spared his wrath. Saddest of all is that his psychosis seems to result from a deep seeded need to belong and to be loved. He isn’t allowed “official” entry to the Tender Trio, so he decimates all other crews until his rule is absolute. Women don’t like him, so he rapes one unlucky enough to cross his path. Everything he touches withers and dies. The sight of happiness and prosperity seems to fill him with contempt. Cidade De Deus remains as potent now as it was ten years ago. It shows Hell through the eyes of an artist who somehow managed to survive the maelstrom. It’s an amazing work, full of life and vitality. It never condescends to or dehumanizes its characters. They are not merely characters or stereotypes. Their plight is not played merely for titillation amusement. Cidade de Deus achieves a certain timelessness that American efforts in a similar vein never approach. Years from now, places like Cidade de Deus will still exist, and movies about such places will still be made. However, I suspect very few of them will linger in the mind like Fernando Meirelles’s masterpiece.